Travel with Kevin and Ruth! : We didn't understand 12 volt batteries! Your RV electrical system consists of a 12 volt circuit, a 120 volt household style circuit. The 12 volt system from your batteries powers your RV lighting, your furnace, fridge, and hot water heater electronics, your fresh water pump, and your furnace blower motor. The 120 volt system (the same as you've got in your house) powers your television, coffee maker, microwave, blender, air conditioner, and any household style electrical outlets in your RV. And, there is also a network to tie those two systems together. When your RV's exterior electrical cord is plugged into an electrical outlet at a campground, there is a converter/charger box inside your RV that converts that 120 volt power into 12 volt power to both charge your batteries and supply 12 volt power to the 12 volt system. When you are not plugged in at a campground, only your 12 volt system will be operational. But many new RVs will also include an inverter that converts the 12 volt power from your batteries to supply the 120 volt system in your RV. And if your RV didn't come with an inverter, you can install an aftermarket one. If you are always plugged in at campgrounds, then you really don't need to read any more. But if you plan to do even one night of camping without being plugged in, then you need to understand your batteries and their limitations. As most of you know, your car truck or SUV has a 12 volt engine battery. But that engine battery is very different from one that is used for the house portion of your RV. The engine battery is designed to supply a short burst of a large amount of power to supply energy to the starter motor. It is called a starter battery. Batteries for your RV are designed to supply smaller amounts of power for a reasonably long time. And they are designed to be drawn down to perhaps 50% of their charge before needing to be charged again. These batteries are called deep cycle batteries. There is a third type of battery, normally called a deep cycle marine battery. These batteries are usually cheap, and often used as an inexpensive way of providing 12 volt power to the system. These are the type of batteries that were in Sherman when we first bought him. We took off across Canada in October of 2007, and didn't even know how old the batteries were. In hindsight, we should have replaced those batteries right away. I knew by the time we reached the west coast in early December that those two batteries we done. And that I had helped contribute to their demise. The most important thing to know is the batteries "state of charge". This is like a fuel gauge for the battery. When a 12 volt battery is fully charged, it does not read exactly 12 volts! It actually reads 12.7 volts. 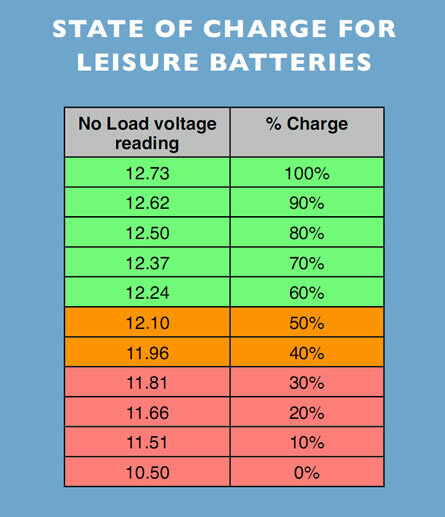 The state of charge is only totally accurate when you are reading resting voltage. This means that there is no power going into the batteries or coming out of the batteries. When your battery is down to 12.1 volts, it is 50% discharged. Repeated studies by battery manufacturers say that this is as low as you want to go without recharging. You can occasionally go lower, but every time you do it cuts into the life of the battery. Repeatedly going down below 11.9 volts will cause permanent irreversible damage to the battery. 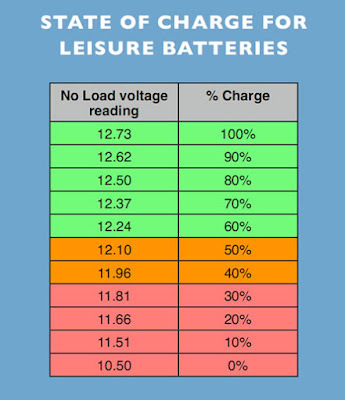 Good posting and spot on information, We keep a close eye on our battery through our solar controller and they serve us well. Present ones are 6 years old and expect to get many more year out of them yet. Ours are also six years old. If you look after them, they will last! You have written a very excellent simplified explanation of the RV electrical system. Well done. Thanks Barney! I wish I had read up on the basics when we first set out. Now you know more! Like I said, we also didn't fully understand when we set out. Now all you need is the RV to put all this new knowledge to work! A great post Kevin, even those of us who think we know the subject need the odd refresher. Getting an "at rest" reading from out batteries is always difficult as the solar panels are providing a constant charge, giving a bit of a false reading so I have to check my readings at night. I am going to print out your chart and keep it beside the inverter with the voltmeter on it. Thanks. Thanks Croft. Yes, the "at rest" reading can be difficult without spendng more money on fancy electronics. But the more you use your own system, the more familiar with it (and it's limitations) you become. Thanks for the lesson in the 12V system. I keep hearing of those using a 6 volt battery setup, so perhaps you could explain the 'positives' of using that setup as well? I throw a 'trickle-charger' on my camper batteries from time to time, but for the most part, I keep my unit plugged into the house, thus they are kept charged anyway. Check out the next post, where I explain why two six volt batteries are better than two 12 volt batteries. I would have benefited from reading something like this when we first set out. Hoping it helps someone out there! Excellent write up. In addition to the fact that you stated that there is normally always power going in or out, there are also times where there are large draws of power or spikes which cause the voltage reading to be well above or below the voltage related in the chart. There are numerous products which will allow a user to get the actual/true SOC for the batteries. These tools measure/record the amp hours out and amp hours in, then relate it to the amp hours available in the batteries which reflect the true SOC. Thanks Peter, and yes you are correct that there is always power going out or coming in. But I was trying to stick to the basics and I know that there is a lot of digital monitoring equipment that you can buy, but even after six years I don't see the need to know the details to that much accuracy. We were just talking about our batteries yesterday. Solar and batteries are truly amazing. My trip this summer to San Miguel de Allende was off-grid for almost four weeks. Never went below 12.1 and I used the laptop, television for local news hour, electric blanket and LED table lamps, water pump, and whatever else. Two batteries go a long way, imagine if I had four. Thanks to you and Croft for helping with the solar panel install. We'll never go back. No problem Chris, we enjoyed doing it. We also love being self sufficient for our electricity! Very concise, accurate writeup. It is hard to write something like this without going off on multiple tangents, but you did it! Thanks Doug. Coming from you (an electrical engineer) that means a lot!